John Ley Pethybridge | Launceston Then! John was born 7th April 1865, at No.2, Tamar Terrace, Launceston to Edward and Emma Pethybridge. His father was a prominent banker and borough councillor. He was educated at Dunheved College and during this time he played for the Launceston Football team. With a natural artistic talent he went to London to continue his art studies, spending some time at a studio in St. Johns Wood. He then studied with John Emms, the renowned wildlife painter, at his residence at Lyndhurst in the New Forest, where he lodged with Thomas Vithyan and his family at Pemberton Road.. He also studied at Newlyn, Cornwall and in Bruges. He is best known as illustrator of Sherlock Holmes’ stories in the Strand Magazine. He also illustrated Eden Phillpott’s ‘My Devon Year,’ reprints of Hawker’s books, like ‘Footprints of Former Men in Cornwall,’ and Byles monumental life of the poet-recluse of Morwenstow. 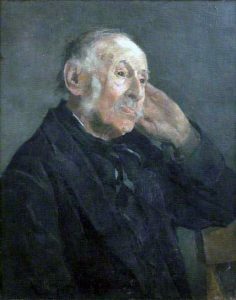 Some of his paintings were hung in the Royal Academy. 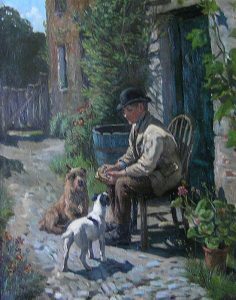 He had a solo exhibition at the Eland Gallery in Exeter in 1903. He was a great storyteller with a mine of Cornish stories. He was also an accomplished violinist and an able banjoist, and was always willing to give his talent for concerts to worthwhile causes. He was an avid sportsman playing Cricket, Football, whilst also fishing and shooting. 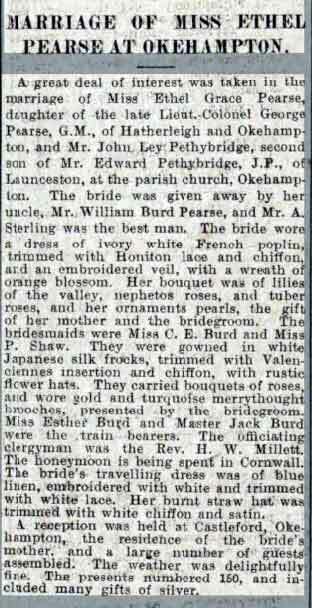 On July 10th, 1902, John married Ethel Grace Pearse at Okehampton, and they set up home at Stratton. Their marriage however, was a short one with John’s health deteriorating during 1905, he was given the news at the beginning of June that he had terminal cancer. He passed away at his brother Frank’s residence in Tavistock on September 3rd, 1905. The funeral took place on Wednesday September 6th at St. Andrews Church, Stratton where he was interred. He left an estate worth £1,153 4s. 1d. 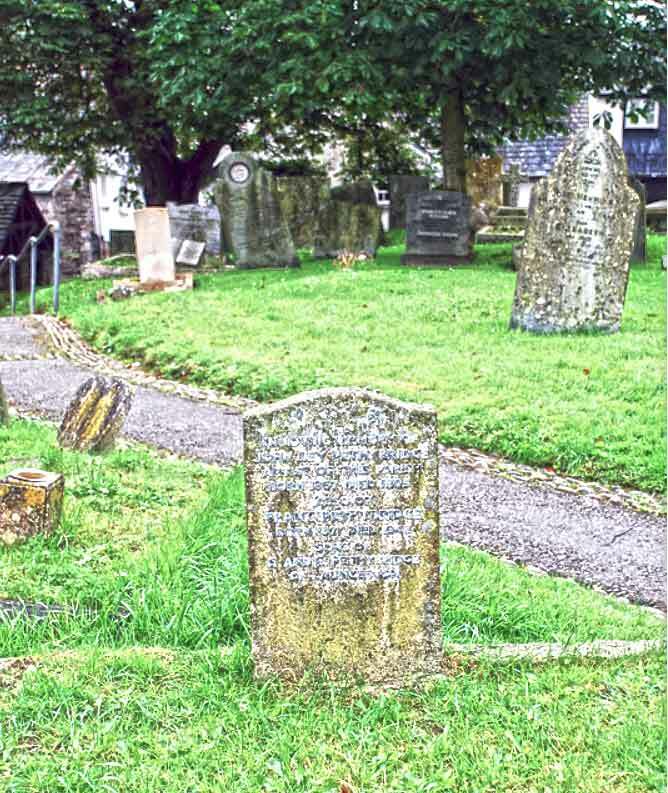 John Ley Pethbridge’s grave at St. Andrews Church, Stratton. John Ley Pethybridge Obituary September 9th, 1905. Below just a small sample of John Ley Pethybridge’s work. 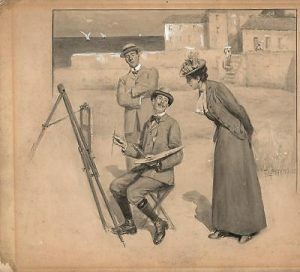 Above left to right: ‘Sharing his lunch,’ ‘Victorian Artist on a Beach,’ and a portrait of William Browning all by John Ley Petheybridge.